Dry skin? Oily skin? Acne? Dullness? This treatment is customized at every step, based on your Face Mapping skin analysis. 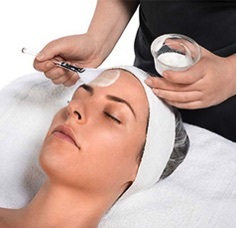 Double cleansing, exfoliation, extractions, pressure point massage, personalized masque and sun protection with unique Complexes, Exfoliants and Botanical Mixers throughout the step-by-step process. This treatment targets biochemical triggers of aging or prematurely aging skin.Treats the deeper layers of the skin so your skin looks healthier and more youthful as time goes on. Includes all elements of the Basic Facial plus anti-aging techniques, ingredients and masques. Most people will experience a marked improvement in their skin with the first treatment. This treatment accelerates brightening, improves texture and balances skin tone while regulating overactive pigment cells. Dermalogica’s unique combination of advanced exfoliation, penetration technology and active peptide ingredients work to treat and control pigmentation at its core. Dermalogica's Signature Skin Treatments utilize state of the art technology, innovative ingredient integration, which includes natural components along with the latest scientific discoveries, combined with effective massage techniques and other dynamic modalities. Backed by the International Dermal Institute, Dermalogica's research, professional training and efficacious treatment protocols are second to none. Ultra-potent and completely customized: you've never had a peel like this before. This comprehensive 60-minute treatment pairs our most powerfuld peel yet with advanced techniques to thoroughly address your skin's ever-changing needs. From over-stressed skin and tired eyes to hyper-pigmentation and breakouts that need to be banished, the Microzone treatments get you in and get your major skin care concerns taken care of in less time than you take for lunch! This treatment leverages thermal activity and the latest treatment room technology to drive potent key ingredients faster and farther into the skin. A bio-charged therapy that delivers intense, targeted results.